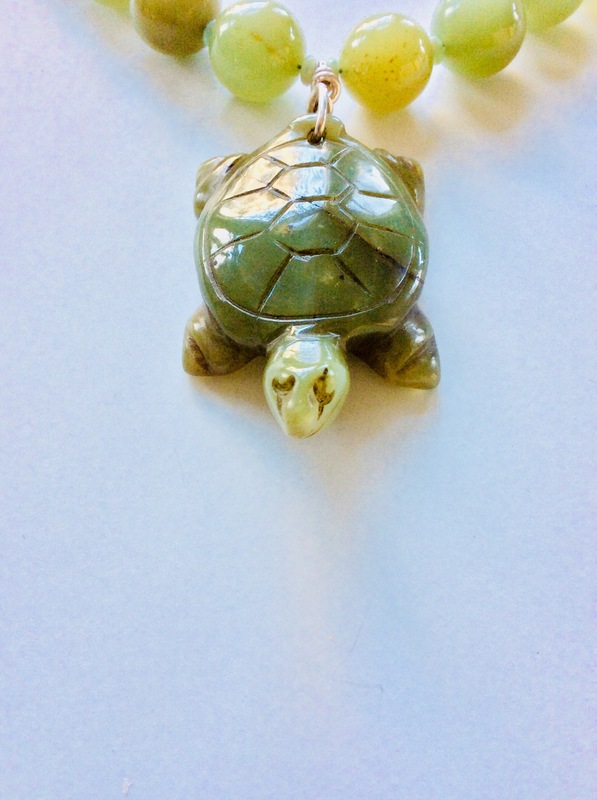 I thought a drawer full of yellow jade would make for a bland necklace until I came across some wonderful artist-made lampwork glass in the yellow jade tone with relief-providing beige highlights! Thank you, Sheila Checkoway (Mass.)! 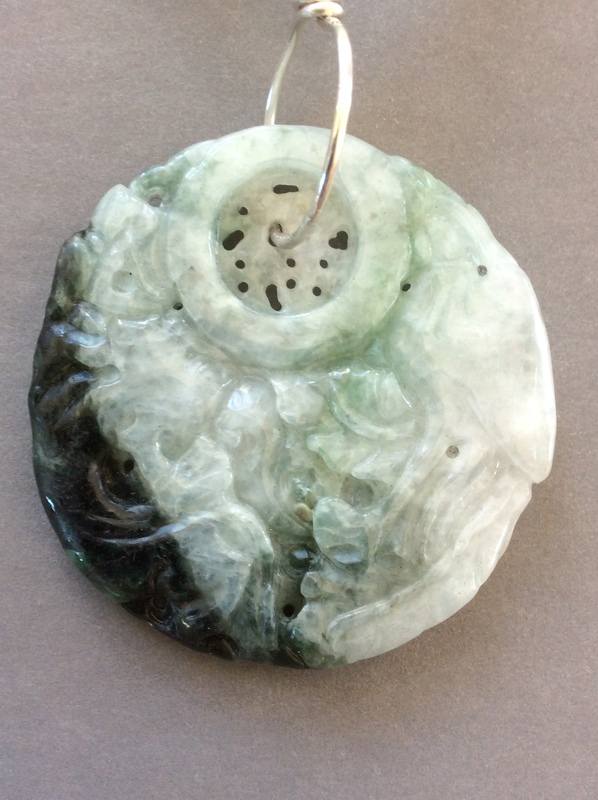 Sheila was featured in a homage to women glass artists in my blog dated April11, 2016. 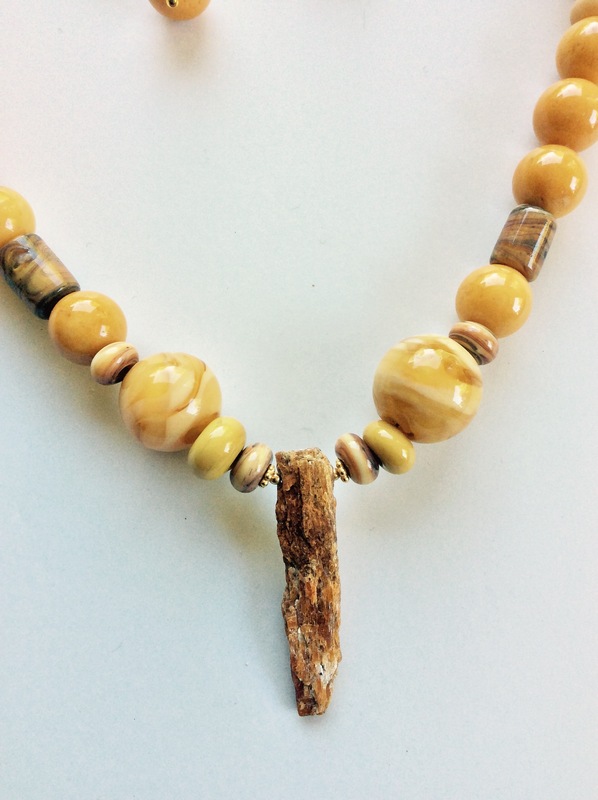 This necklace contains 20 of her beads, each slightly different, and 22 beads of yellow jade. 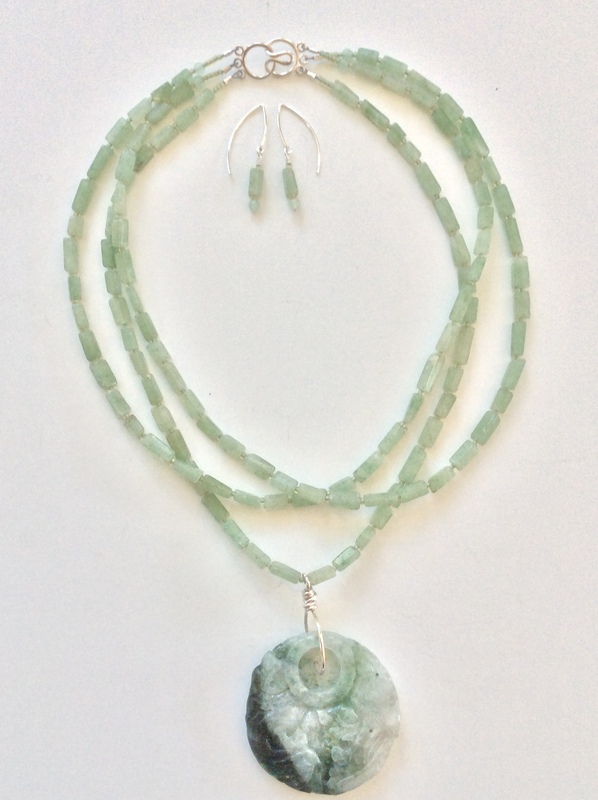 Sheila also found the centerpiece, a blade of kyanite, on her travels in Tanzania, Africa. Kyanite is an aluminum silicate mineral (crystal) found in the long blade format you see here. Blue is the most common color but this orange tone was recently discovered. I also purchased two longer blades that are quite orange; this centerpiece is subtle in its orange and harmonizes well with the yellow jade tones. Google raves about its amazing metaphysical properties, so check it out if that is your interest. I shall summarize it thusly; kyanite is a bridge, an extraordinary crystal that creates pathways where none existed before. I discovered yellow jade in Hong Kong, site of an incredible Jade Market accessible to all, but you will have to wait until Drawer 49 to see the unique green color of local jade, bought at the Jade Market in the 90’s, for more info on that subject! 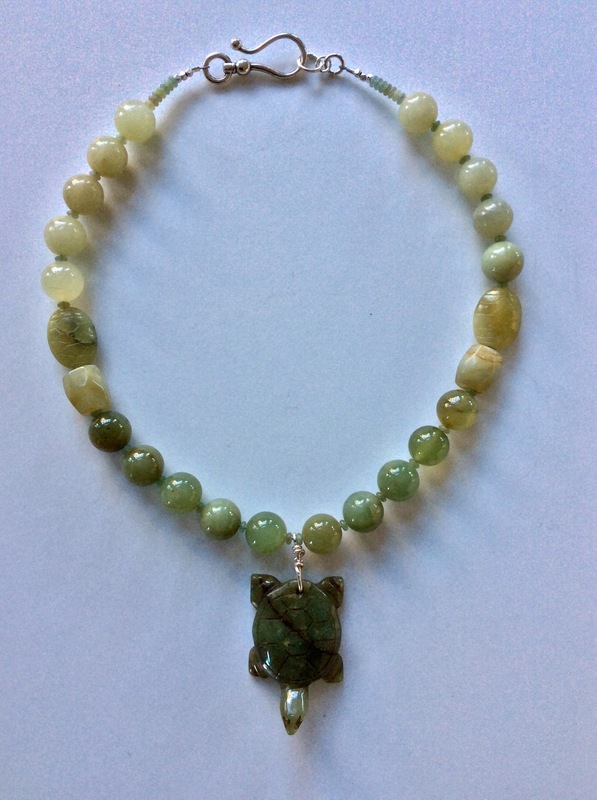 Yellow jade is less available than green jade or new jade which is a pale shade of green. The Chinese started mining yellow jade in 6000 BC. Confucius (551—479 BC) thought it had properties that encouraged purity, bravery and honesty. Its yellow varies from lemon to golden; I have mostly the shade you see here which in my mind is mustard seed. Its yellow properties are caused by iron leaching during its weathering stage. Yellow jade was beloved by Emperors and the Imperial Court; mostly sculpted into imposing foo dogs and pagodas. 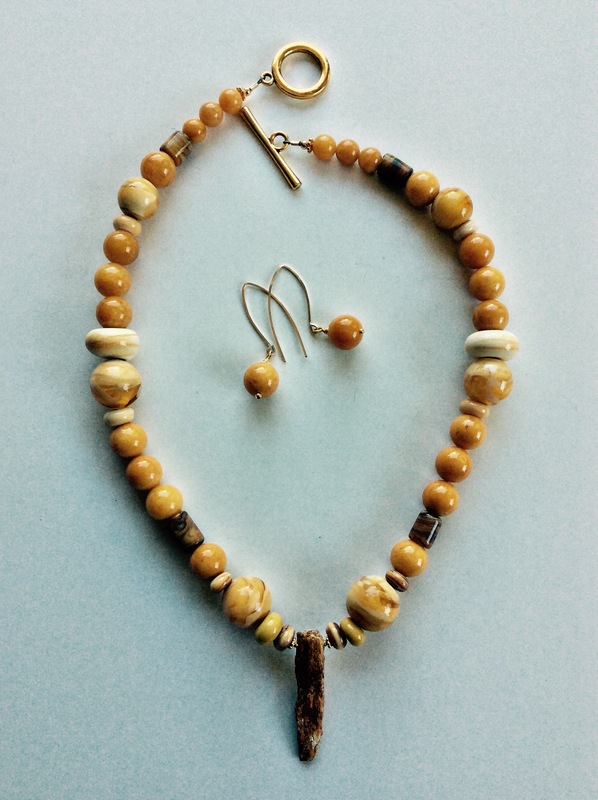 The necklace is 19” and has a brass clasp and vermeil beads. Matching earrings. $119.